I had a little excitement in my world this morning. When I went to take my dogs outside in my backyard I heard a strange squeaking kind of sound. I sat down to drink my coffee while the dogs did their business, but the sound kept on and kept on. It seemed to get louder and more emphatic and then it finally hit me. It was the sound of a bird, either angry or distressed. I quickly searched for my big dog (my little dog is completely blind so I knew she couldn’t be the offender) and found him in the bushes by my house. When I walked over the bird flew to the other side of the yard. That is when I saw the little guy sitting in the middle of the yard. As I walked to it Mom of course got madder and madder. He hopped and my dog thinking it was a toy ran to get it. I yelled and he backed off long enough for me to catch the tiny thing. I looked and looked for a nest but there are so many bushes and trees around here it was impossible so I brought the little guy in, put him in a box with a towel and on top of a heating pad on warm. I had no idea what to do. I used to work with a group called Project Wildlife for many years in San Diego, but as luck would have it I never worked with the birds (I was afraid of the owls and hawks they had to rehab). So I jumped online, found an animal rescue group, and called them. Turns out it was a fledgling and it is normal for them to be on the ground for a few days with Mom and Dad watching over them, teaching them what to eat and about dangers. I put the little one back in the yard and when I saw Mom I kind of shooed him in her direction. He fluttered to her and they had a happy reunion! Now I just need to keep an eye on my dog so he doesn’t look for his new toy!! OK, enough with my wildlife stories. Let’s get on to the booze right? I mean this is Tipsy Tuesday! Well I was bouncing a few things around in my head when my son came home from work and said, “Mom we made this awesome shot drink at work last night you have to try it!”. I usually look more for cocktail types of drinks for you all, but he told me it was called a Salted Pretzel it peeked my interested. Every year I make chocolate covered pretzels for Christmas, they are one of my favorite treats. Sweet and salty? How can you go wrong with that? So he quickly got to work whipping up one for me. After I tried it I first had another, then decided that it tasted like it had caramel flavor along with the salted pretzel flavor. Hence the name change. This is not a drink I recommend drinking all night. It is not a strong drink, but it is a shot and it is sweet. I think these are a great party drink as a little change to whatever you might be drinking for the night. During BBQ’s we are usually beer drinkers and after the BBQ and potato salad and coleslaw, this is a nice little “adult” dessert in a glass! 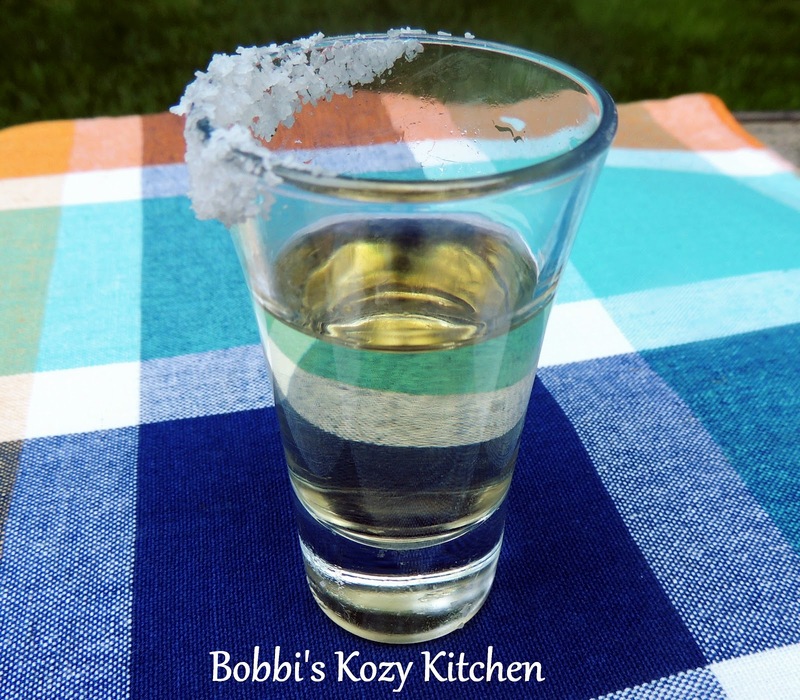 Wet the rim of a shot glass with lime juice or water. Dip one half of the rim of the glass into salt. Carefully pour the vodka and liqueur into the glass on the other side so you don’t wash the salt into the glass. ENJOY!! !